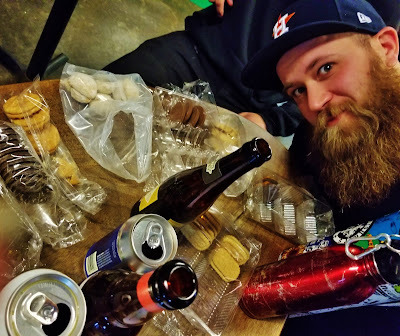 Our annual sugar fest in which we support the Girl Scouts and use as an excuse to play with beer happened Sunday. 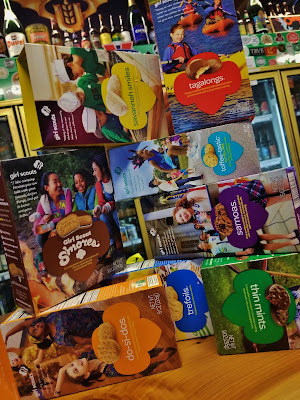 Last year we split the event into two separate days since we were able to get our hands on some out-of-state offerings and while that was fun, what we have access to here is more than enough to put us into sugar shock. Per our usual we gathered at our favorite watering hole (which by the way was just named as Oregon's favorite beer bar by Craftbeer.com's readers), opened all the boxes and started hitting the coolers to pull out beers to pair with the cookies. First up was Chris' pick of Berried at Sea from Pelican, their Tsunami Stout that was aged in oak barrels with blackberries and currants to re-ferment. Along the lines of a sour stout, the acidic profile somewhat distracted from the overall profile of the beer. Nonetheless, it found a peanut butter partner to its "jelliness" in the Do-Si-Dos and Tagalongs. Going a lighter route it created an acid-expected berry lemonade flavor with the Savannah Smiles, which we've agreed is The Best Beer Cookie (more on that below). Another beer that made fast friends with the two peanut butter cookies was Fort George From Astoria with Love, the Russian Imperial Stout is the base beer for all of Fort George's Matryoshka variants. Mag was impressed by Do-Si-Do's ability to hold its own against the 9.4% beer while Kris would be happy to sit down with a box and a few cans to fully indulge in the rich pairing. Speaking of decadent pairings, Left Hand Wake Up Dead Russian Imperial Stout made for a great one with the other peanut butter cookie, Tagalongs. For a more complimentary pairing to the Do-Si-Do's, reach for Crooked Stave St. Bretta. Now available in 12oz cans, the beer pleasantly lightened the richness of the cookie while the cookie brought to the forefront more of the dryness in this Saison. Samoas, historically a difficult cookie to pair due to the coconut and over the top sweetness, found many beer friends this time around. Falling Sky Juniper Rye, Boulevard Rye on Rye and Baerlic What The Fluff also paired well with the S'mores graham cracker sandwich cookies. So, too, did pFriem Cognac barrel-aged Belgian Style Dark Ale. The 10.3% beer was well balanced between its booziness and its Belgian characteristics. 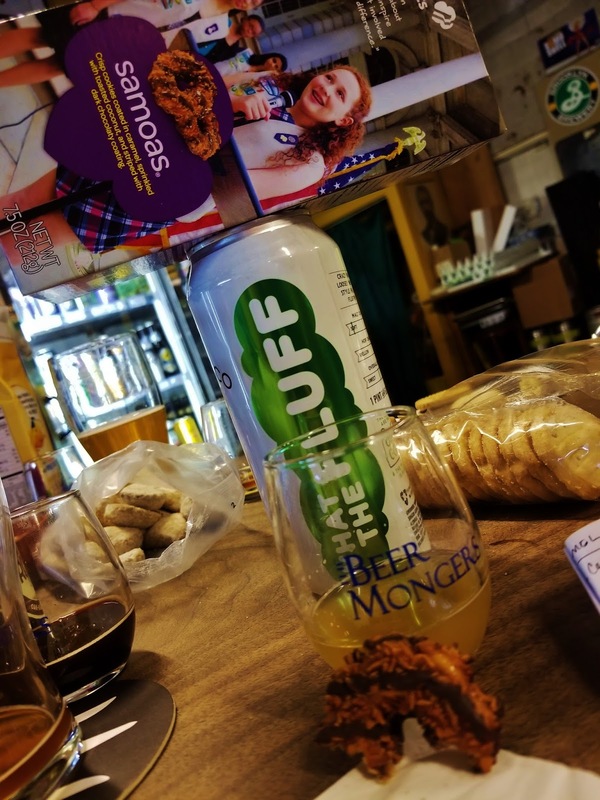 Toffee-Tastic, the Girl Scout's gluten-free offering, is a cookie that has surprised us from day one both with its flavor and texture as well as its ability to pair well with beer. 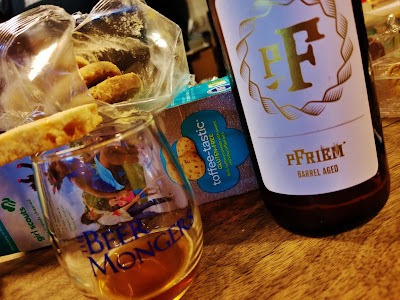 This year our favorite beer we paired it with was pFriem Cognac which accentuated the rich butteryness of the cookie. For those who prefer to have that buttery quality tempered, we suggest going with Crooked Stave St. Bretta. Thin Mints, one of the staples of the Girl Scout cookie line up, have typically been most successfully paired with stouts and that trend continued this year when paired with Left Hand Wake Up Dead Russian Imperial Stout. 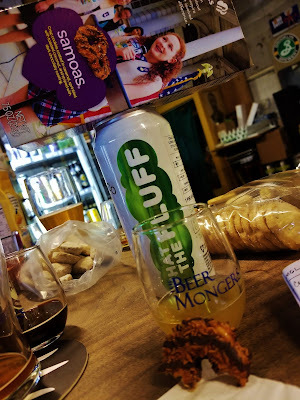 The boozy beer balanced nicely with the cookie's minty profile. Shortbreads were another cookie we'd paired often enough that we didn't dive too deep into that well but found Pelican Berried at Sea, especially once it had warmed, made for a nice companion. Thanks to our Sunday Monger, David, for keeping an eye on us. 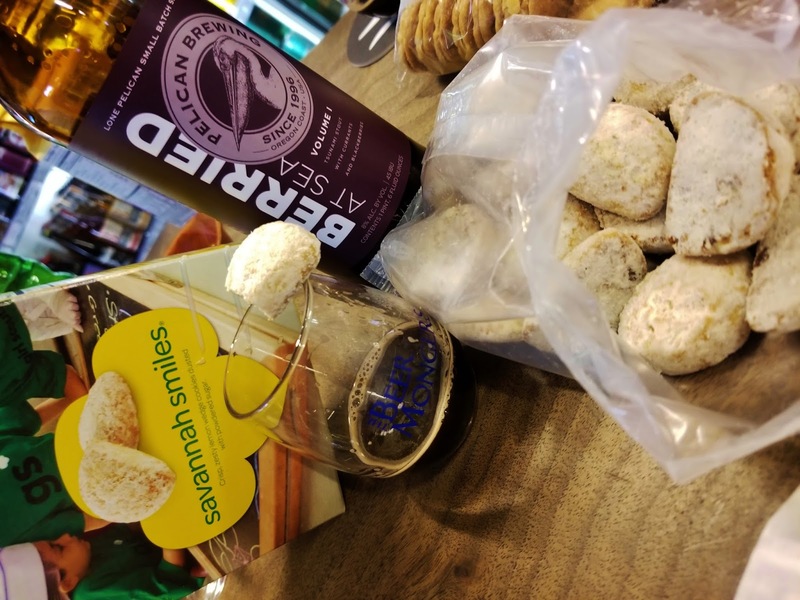 Saving the best for last, our picks for the top beers to pair with The Best Beer Cookie, the lemony, powdered sugar coated, crescent shaped Savannah Smiles. Beer is tasty, beer is fun, beer is better with friends. We're already brainstorming on our next beer and [something] pairing. If you have ideas for what you'd like us to play with, leave it in the comments. 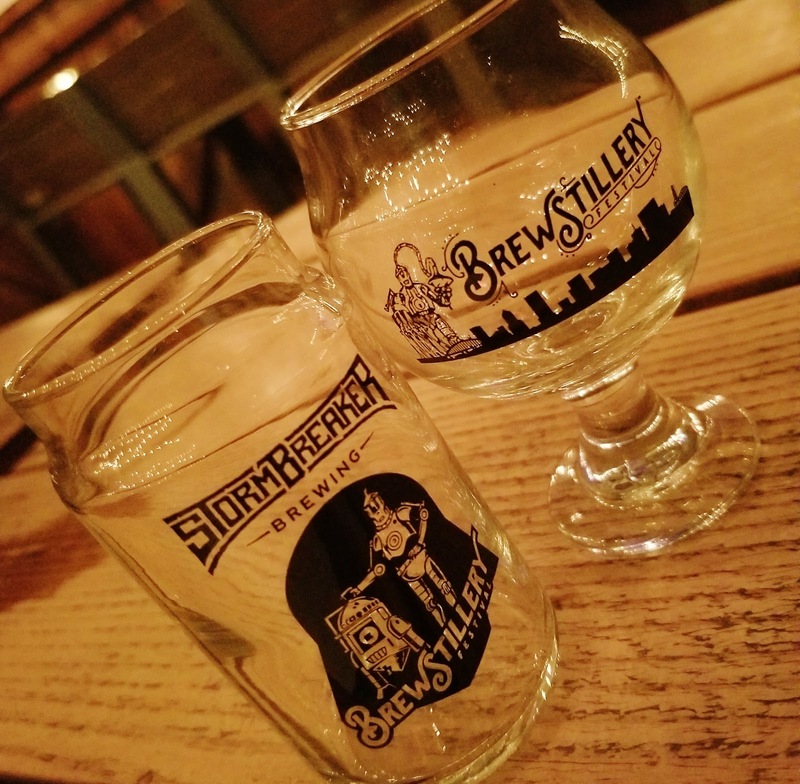 Now in its fourth year StormBreaker's beer and spirit pairing event, Brewstillery, returns this Saturday. For the uninitiated the festival brings together local breweries and distilleries to create perfect pairings - 4oz of beer and 1/4oz of the selected spirit. While we'd encourage you to try at least a couple of them paired, if spirits just aren't your thing or perhaps you'd prefer to try out a bunch of spirits, no problem. 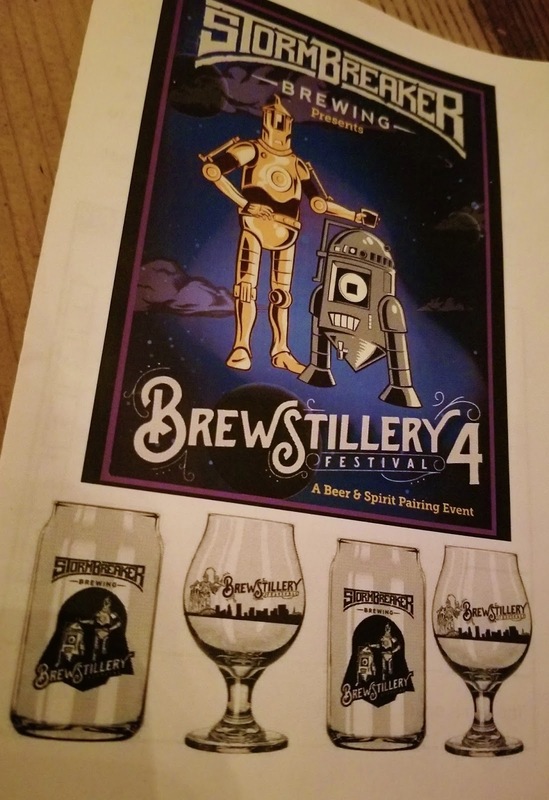 Each tasting ticket is good for either a beer pour or spirit taste. How you spend your tickets is completely up to you. We recently had the opportunity to try a handful of this year's pairings and are pleased to report that they brought a smile to our beer-loving mouths. So that you can get an idea of what will be offered, here's a recap of what we tried. Triple IPAs can be hit or miss with us. Too sweet, too hot, there are many ways to screw them up however StormBreaker nailed this 10.5% version. When paired with Big Bottom's 91 proof Bourbon, it tastes closer to 5% and the two are well balanced with the port characteristics in the Bourbon contributing to the smooth finish of the beer. Nocino, a liqueur made from unripe walnuts picked in late June, is one of the few spirits we enjoy outside of a pairing situation. This 60 proof spirit presents with a spicy aroma and finds a wonderful partner in Cascade's 12% Belgian quad that was aged in bourbon barrels with orange peel and coriander. Less sour than many of Cascade's beers, the heavy orange characteristics of the beer make the pairing feel cocktail-like. Gin is our go-to spirit so we were expecting a lot from this pairing and it didn't disappoint. Cricket Club's flavor profile is lemongrass-heavy (but not overly so) which combines pleasantly with the chamomile component of Bes. We agree with Little Beast owner Chuck Porter that this pairing is "a refreshing change to [some of the] heavy beers and liquors" you'll find. Bluebird is distilled from spiced apple kombucha, a process which transforms 35-45 gallons of kombucha into 750ml of Bluebird. The result is delightfully herbal, especially when it's made into a cocktail with lemon juice and IPA wort, then topped with Carina. In our opinion, the cocktail is far superior to the sum of its parts. We hope your interest has been peaked and that you're ready to hit the "buy" button to a festival in which you'll almost never have to wait in line due to the nature of the sampling. If so there are two options available. What's the best way to eat a salad? With a beer of course! 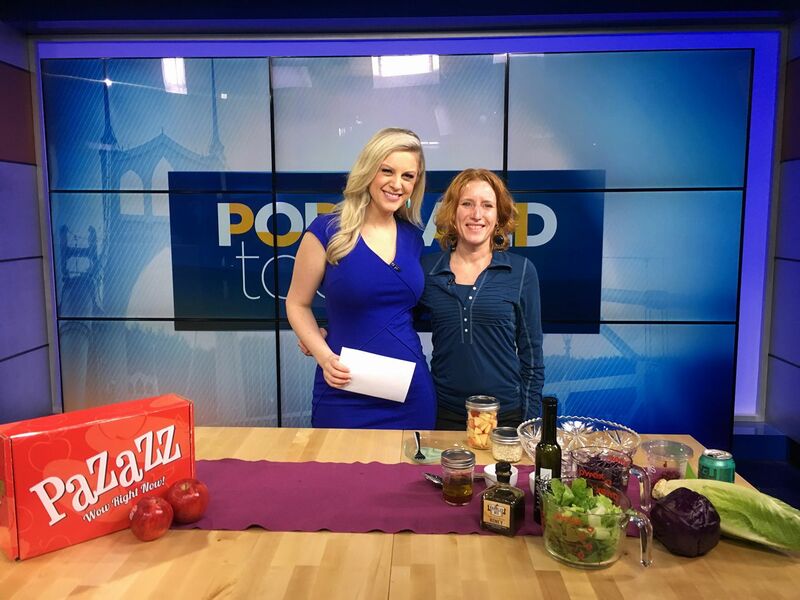 This week we made our TV debut on KGW's afternoon show, Portland Today, demoing a winter salad that features a new apple variety, Pazazz. We were contacted by the Pazazz people a few weeks ago, found multiple ways to enjoy this relative-to-Honeycrisp apple and got to be the local face for their apple on an installment of the show's In the Kitchen segment. Watch us in action! We couldn't pass up the opportunity to find a beer to pair with this salad and after taking under advisement the suggestions of many of our fellow beer and foodie friends we found one. That beer is Ready Player One, a dry-hopped Saison from Level Beer. The fruity, flavorful beer compliments the mild sweetness of the salad yet remains restrained enough to let all of its flavors come through. Many thanks to the Pazazz people! This was a great experience and it's likely this easy, tasty salad will be a return visitor at our table. Toss together romaine lettuce, red cabbage and Pazazz apple. Whisk together olive oil, red wine vinegar and honey and drizzle over salad. Toss to distribute the vinaigrette and season with salt and pepper. Top with pomegranate arils. - Pazazz apples can be found in Portland at Sheridan's in SE and QFC. Don't peel 'em! Not only does the skin add color to the salad but there are nutrients in there. - Any honey can be used but our honey of choice is The Barreled Bee barrel-aged honey. - Pomegranates are a bit fussy but containers of just the "seeds" can be found in most produce sections. - Make the salad more hearty by adding a protein of choice (i.e. shredded chicken) or grated mozzarella cheese. Brunch is a big thing in this town. If you're thinking "duh" or "really" just keep in mind that this comes from the perspective of a non-native Portlander, who although feels this place has become home, still has a bit of outsider's perspective. We don't go out to brunch often, usually only when we have visitors in town, and when we do we typically avoid the popular/high visibility places. Waiting, hungry and in need of coffee, is not a way to start the day especially when there are tons of great places to brunch. 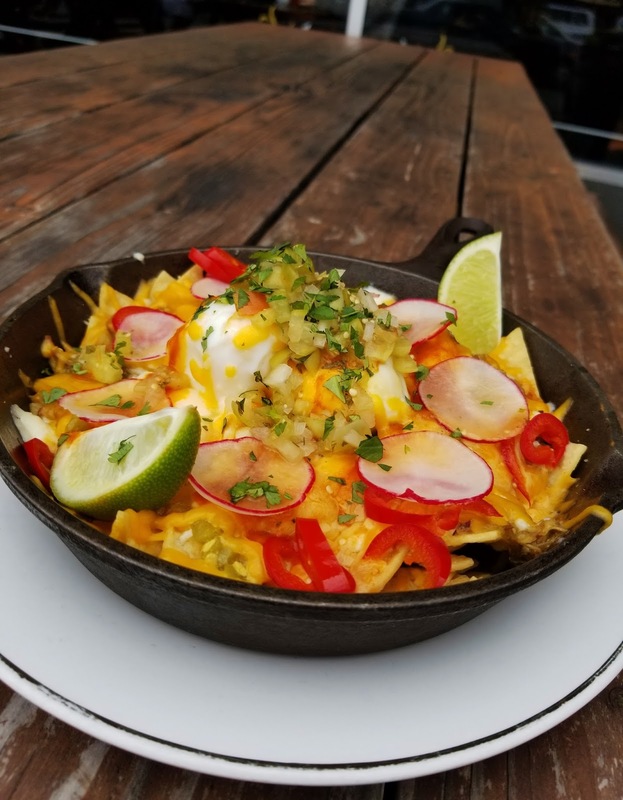 Depending who we're brunching with determines if we're looking for a place with great [insert favorite dish of our visitors], a place with stellar bloody marys/mimosas or some other factor. 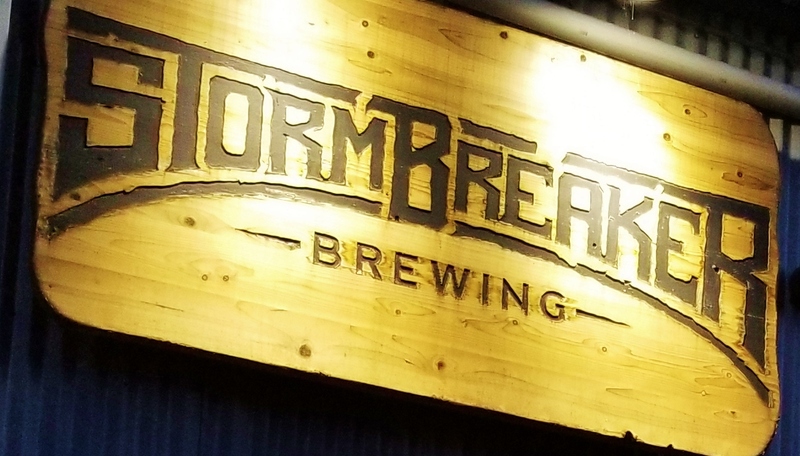 If we were going out on our own a deciding factor might be a place that has a great morning beer on tap that pairs well with food. In that case, enter Burnside Brewing. Burnside opens at 11am daily, including on the weekends when the brunch menu is available. 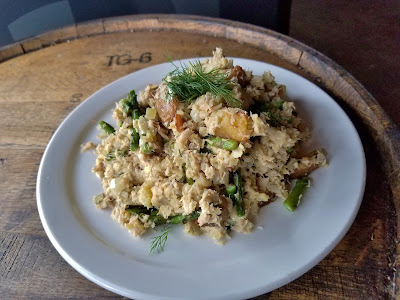 We recently had the opportunity to try out some of Chef Richard Watt's brunch items, one of which we really dug with a new offering from the brewery side of Burnside, Wau, Nessie! First seen at the NW Coffee Beer Invitational 2018 at Goose Hollow Inn, and now available at their pub, it is the second collaboration beer in Groundwork Coffee's 'Brewers Series'. The Coffee Wee Heavy Ale features Groundwork's organic single origin Papua New Guinea roast, a medium roast coffee, from the Wau Co-Op. It was one of our favorite beers at the festival and is overall, one of the best Scottish ales we've had. Malty and caramelly as one would expect from the style, the coffee further balances the beer so that instead of being cloying it whispers, "coffee...you like coffee in the morning...come drink this in the morning." Going back to the brunch item that we found to pair particularly well with it is the Smoked Trout Hash. What it's lacking in visual appeal it more than makes up for with smoky flavor. Not a fan of smoked fish? Then perhaps you'll dig on their Chilaquiles, a pile of loaded tortilla chips served in a cast iron pan (think nachos that are better eaten with a fork), or the simply seasoned, carb-o-licious Crispy Potatoes. 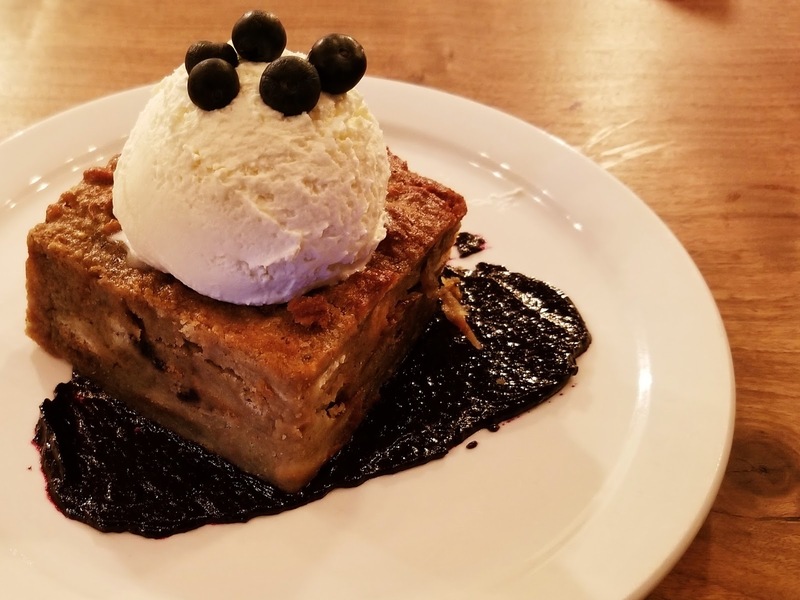 If you're more of a sweet-for-breakfast person then the Donut Bread Pudding is for you. It's usually listed on the specials chalkboard near the door but even if it isn't, ask your server. Created from buttermilk and blueberry (usually) donuts from their neighbors down the street, Delicious Donuts, this cinnamony treat somehow manages to avoid being overly sweet and retains the airiness familiar to most donuts. The "icing" on this "cake" is a super dense whipped cream that looks and tastes closer to ice cream than the whipped cream we're used to. While we hope you enjoy the Wau, Nessie! as much as we did, if you are there for brunch and hope to get anything else done for the day you may want to have just one. It goes down far easier than many 10% beers, a quality that speaks to the skills of the Burnside Brewing team. Through February 7th $1 from each Wau, Nessie! sold will be donated to the Cafe Femenino Foundation, an independent non-profit organization that funds community betterment grant requests proposed and managed by women in coffee-producing regions around the world. One last note, perhaps as you rearrange your weekend plans to fit in brunch at Burnside, is that all day Sundays IPAs are a mere $3. 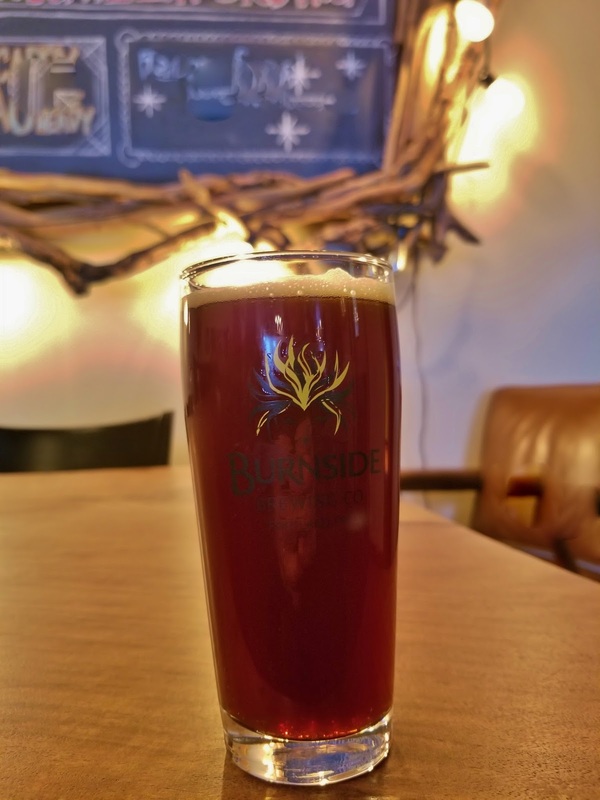 So whether you go for the beer, go for the food or go for the killer Sunday price on IPAs, consider Burnside the next time you're heading out for brunch.